Hello there, stamping friends! This week at the Paper Players, it's my turn to be the challenge hostess and I came up with a Clean and Simple (CAS) theme to take for a spin. 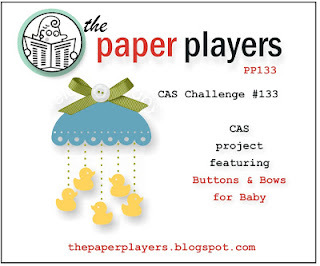 Simply create a card for baby, making sure to add buttons and bows to the design. Easy, right? Please join us! The little onesie is from the Baby Tees Jumbo Wheel stamp. I added the popped-up hearts to the front at the very last minute to cover up my "coloring mishap" underneath. Oops! All of the supplies I used are listed at the end of the post,. I hope you will join us this week at the Paper Players. The challenge is open through Friday, February 22nd at Noon (PDT). If you re looking for a little more inspiration, please stop by and visit the rest of the Design Team to see what they came up with for the challenge. Have a great day today! This is precious Anne Marie! Love your glittery heart and rosy pinks! This is gorgeous AM! I especially love that glimmer heart on the onesie!! What a lucky thing to cover the colouring mishap! LOL!!! The hearts look great! Precious baby card!! Love those colors together too. So adorable, love the details! What a beautiful baby card! I love the ribbon you chose, and I think the polka dots and chevrons are a perfect pair. Thanks for the fun challenge! Sweet baby card, Anne Marie. I like the sparkle heart and your layout is great. Great job on the cover up, it seems this stamp does the same thing for me. I may be pushing down too hard on the ink pad. I also had to do a cover up. I think I like your cover up the best! This card....It is beautiful, love your buttons and bows! This is a very beautiful card. What is cool, the colors came be changed up for gender purposes. Thanks for sharing. Just adorable....love the more intense pinks you've used!!! A wonderful challenge, I just loved it! Who would not want to get that adorable little card?! Fantastic as always! Adorable, Anne Marie! I love the bling and the color combination! Great minds think alike, Anne Marie! Love how you stamped your baby tee on Crumb Cake, and colored just the trim. I also love how you put your button on the bow, and of course the pink polka dots. Thanks for a great challenge!